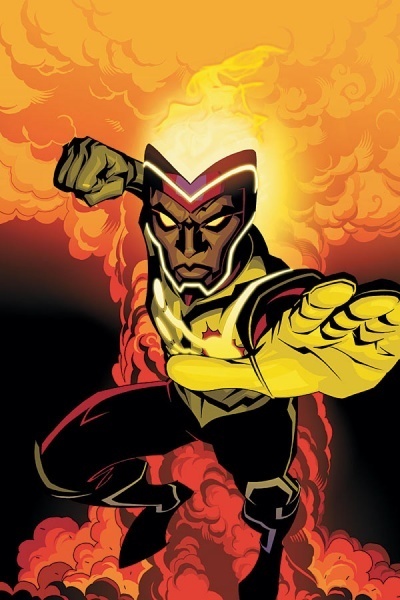 Powers: Jason’s powers stem from the fact that he is bonded to the firestorm matrix allows him to see the past and sometimes future of those once bonded to the matrix. Other abilities are that he can transmute matter whether inorganic or organic in any manner imaginable regardless of weight and mass. He can fire concussive or thermal bolts from his hands, see into the infra red and magnetic spectrum as well as see the thermo nuclear bonds in things. He has superhuman strength, speed, endurance, regenerative abilities and flight. While in powered form he can survive in the vacuum of space unaided and has no need for sustenance. He has also been noted to phase through solid objects. Temporary powers: For awhile he had to bond with random people to stabilize the matrix to maintain his powered form but this is no longer the case since he’s been bonded to Ronnie Raymond. Also he had a telepathic connection to deceased girlfriend Gehenna before her death. Jason Rusch grew up in a loving family with his mother and father until his father lost a hand at work and his mother abandoned them, this made his father angry and abusive resulting in Jason becoming timid, meek and lacking in confidence. When Ronnie Raymond was mortally wounded the firestorm matrix sought out and bonded with him. It gave him all the powers of previous Firestorms. The new matrix was unstable however and Jason had to always bond with another person to maintain or even access the firestorm powers. He used his powers as best he could to aid those around him though things didn’t always go as planned. Over time he gained and mastered powers that no previous Firestorm had ever done and in doing so found the strength to stand up to his father. During infinite crisis he was part of Donna Troy’s team who went into space to take on Alexander Luthor. Here he bonded with the elemental firestorm Professor Stein before returning to earth. On earth him and Firehawk tried to lead a new Justice League but that didn’t work. It was then discovered that he possessed a ¼ o the life equation which could hinder Darkseid’s anti life equation so him and Shilo Noran/ Mister Miracle were targeted by his forces though they managed to fight him off though he lost Professor Stein to Darkseid. He was then instrumental in defeating the injustice gang and Batman invited him to join the justice league where he became friends with fellow black superhero Vixen. During Blackest Night the JLA are attacked and Jason is separated from Ghenna who is killed by black lantern firestorm while he absorbs Jason into his matrix. He is later released when a white lantern ring brings Ronnie back to life though he is still traumatized by his girlfriend’s death. During brightest day he is one of the heroes responsible for resurrecting the guardian of the white light and defeating the black lanterns. It’s also discovered that he and Ronnie’s continued conflict could cause another big bang resulting in the end of all life. At the end of Brightest day Jason realizes that in less than 90 days they will detonate. Jason Rusch, The living Atomic Flame! ← D.C comics Black Superhero previews!